North Korea is a bad place / it’s been a bad place for some time now and it’s apparently getting worse. One of only 4 Communist countries left on earth (China, Cuba and Vietnam are the others) the “Democratic People’s Republic of Korea” is destitute, desolate and pretty much defunct. Ever since Russia and China discontinued their support in the 1980’s and ’90s the country has nose-dived into a completely isolated dictatorship and major blemish of abject poverty. Escape is virtually impossible, mentally and physically, but there are some very brave and desperate folks who do. 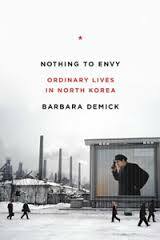 This is the story of five survivors from Chongjin who are now living in South Korea, as told to Barbara Demick who wrote a series of award-winning articles for the LA Times which she transformed into this incredible book. Starting with an explanation of how she came to write this, Demick moves to cover a bit of the interviews themselves and then into the substance of the tales. It’s basically a linear telling a chunk at a time from each subject’s life, of what life was like in Chongjin and how it got worse; why did the subjects decide to defect and how did they get to Seoul; finally, how do they find life in South Korea? The tale of Mrs Song, a middle-age married and working woman, is riveting and that of Jun-Sang and Mi-ran, the young lovers, rather sweet. Kim Hyuck’s story is so sad and horrific in part because he is so young, while Dr. Kim’s story is just plain heart-breaking. Mercifully, we do know from the context that these five subjects survive to tell their tales. I have to only wonder at the hundreds, more like thousands, who didn’t. One more thing, the end notes are terrific!